Indian skipper Virat Kohli on November 20 added another feather to his cap as he equalled former Indian cricketer Sunil Gavaskar’s record of scoring most number of centuries (11) in Test cricket as a captain. 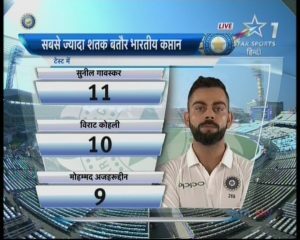 Virat Kohli achieved this feat during the on-going first Test match between India and Sri Lanka at the Eden Gardens in Kolkata. Sunil Gavaskar, who played his last Test match against Pakistan in 1987 after making his Test debut against West Indies in 1971, has 11 centuries under his belt in Test cricket when he led the Indian side. Virat Kohli, on the other hand, scored his 18th Test century – 11th as captain – during the first Test against the Lankans. Came into bat at No 4 following KL Rahul’s dismissal at 199/2, Virat Kohli played 119 balls to register this feat. Virat (104 not out) smashed 12 fours and 2 sixes as Team India took 230 runs lead in the second innings. Soon after Virat Kohli reached his century, his 50 in international cricket, Team management declared the innings and set 231 runs target for Sri Lanka to win this Test match. Interestingly, Sri Lankans have never won a Test match on Indian soil.